Well because I had a wonderful weekend, I am back in action, completely recharged. Bangalore has this happy aura, like an old aunt with welcoming arms ready to hug you! It always makes me want to live there every time I visit. But what I want to tell you most about my recent trip was this gem of a place we discovered. So on Sunday night, me and my best friends went to this place called Opus. The disclaimer on their website (www.myopus.in) explains the vibe of the place perfectly “Opus, derived from it's mascot the overweight but very multifaceted octopus, in Latin, means a 'piece of work' of art or music. Started by Gina and Carlton Braganza, it is also all things Goan. Laid back, unpretentious and a vibe that is infectious, it has a warm hearty kitchen and a well stocked chiller”. Opus is not a restaurant or a club. It is a family. You enter the gates of what I suspect is a converted bungalow and hope they are still holding the table you had booked. Or you can plonk yourself on one of the seating areas on the floor strewn around with pebbles. Every Sunday night is what they call KroaKnight which transforms this place into a karaoke bar. There is a stage in the front where you can volunteer to go and sing or you can just kick back and enjoy while someone else does the honors. The show started around 10pm and by 10:15pm everyone was on their feet swaying to the songs and singing way too loud!! Most people there seemed like regulars who would do anything but skip their Sunday nights at Opus. The food was incidental so I am not even going to dwell on it. There was some goan prawn curry we ate. And then there was the singing!! I have never before been part of a community crescendo singing songs that I have never heard before. No one cared if you sang well or went off tune. As long as you sang loud, you could stay! 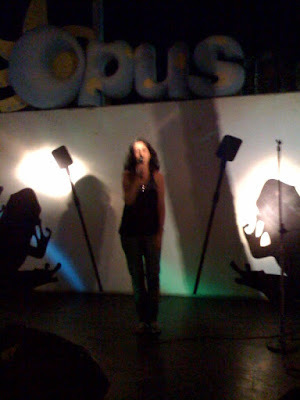 Opus is Bangalore’s best kept secret (or is it?). If you like the sound of it, do drop in the next time you are in town. I can recommend it whole heartedly!! I only have 2 regrets. I wish the Husband was there with me, he would have loved it!! And I wish I had opened a place like this before they came up with it! Here’s a snap of S (the only one of us who had the guts to go on the stage) doing her number. The snaps blurred but you get the point…. 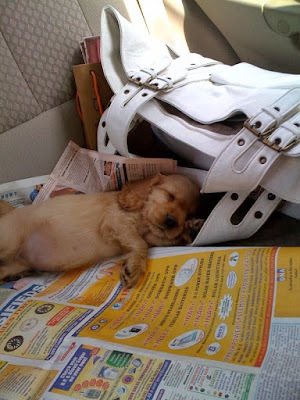 Before I sign off, this is B’s new doggie. She barely fits in a palm, is a cocker spaniel and has been christened Pocahontas.